Following the publication of your post here, I have written to your newspaper by e-mail, expressing my concerns about the piece, and inviting the newspaper to contact me to discuss it informally, to avoid the need to take expensive and (to you) potentially damaging action in order to protect my professional reputation. Since your newspaper has not troubled itself to contact me, I am forced to take the step of contacting you and the newspaper more formally, which I am in the process of so doing. In the meantime, however, I am writing here as the most direct means of contacting you, to ask you to remove from this post all references to myself, as being libellous and highly damaging - the precise details of which will be passed to your newspaper shortly. You may, of course, leave this message visible or remove it, but you may wish to note that the addition of further comments arising as a result of references to me remaining in your post, and which are also of a libellous or denigratory nature, may form part of any subsequent action which I choose to take. Commentators who choose to comment on this post may also wish to note that I would be happy to enjoin them in any legal action taken against Mr Monbiot or The Guardian newspaper if they too are of a libellous or denigratory nature. You have been warned. In the wake of the Prefero report, we now have Greenpeace weighing in with a report headed: "Dealing in Doubt: The Climate Denial Industry and Climate Science. A Brief History of Attacks on Climate Science, Climate Scientists and the IPCC." 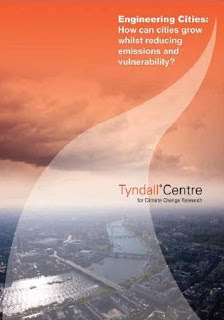 The Tyndall Centre for Climate Change is proudly touting its 40-page brochure on climate change in cities. Cities, we are told, are concentrations of vulnerability to the harmful impacts of climate change. They are also, directly and indirectly, responsible for the majority of the world’s emissions of greenhouse gasses. 50% of the world’s population lives in cities, a number that is set to increase to 60% by 2030. For all of these reasons, cities are on the front line in responding to the threats of climate change. For further details, you must contact Professor Jim Hall, School of Civil Engineering and Geosciences, Newcastle University. By some strange coincidence, that is exactly the same detail on a grant application to the Engineering and Physical Science Council (EPSRC), which just happens to have given him £124,385 for a project labelled SCORCHIO: "Sustainable Cities: Options for Responsing to Climate cHange Impacts and Outcomes". SCORCHIO, it turns out, is a bit of a bun fight for academics. Not only is Newcastle University a beneficiary, Professor GJ Levermore of the University of Manchester has also done rather well out of it. He as scooped the jackpot of £319,234 for his part in the project.